The year is 2252 and Loman Phin is in trouble. A washed-up channelship racer turned freelancer, he hits pay dirt with his latest mission: a fortune is on the line if he can transport forty-three kilograms of human skin to a remote villa on Pluto's moon, Nix. Little does he know his very life is at stake when he gets caught up in an ancient feud, chased by a space vampire, and forced into a death-race by the king of Ceres. Meanwhile, danger is always hot on his heels in the form of a massive space freighter out for Loman's blood. 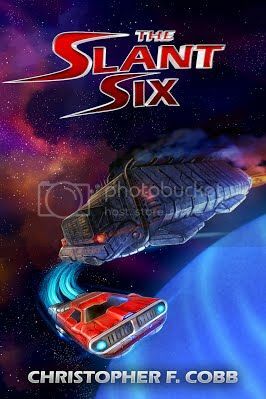 With just his wits, his friends, and his beat-up cruiser, the Slant Six, Loman sets out on the most dangerous adventure of his life. Loman squeezed the control stick, his knuckles turning white. The Slant Six blasted from the tunnel directly into traffic, crisscrossing the expanse of Island Earth Grand Central Station. The little channelship was a mere speck of dust inside a giant tumbling drum of organized chaos. “Twelve o’clock!” Portia pointed to a great lumbering whale of a black Bentley that sailed across their trajectory, blithely unaware that both ships were on the verge of becoming unrecognizable husks of burning scrap. Loman jerked the stick to the left and pushed it downward. With an abrupt drop they angled sharply underneath the leviathan. As she lifted off the seat, Portia felt her stomach clench into a knot. She clapped her hands to her mouth to keep from vomiting and kept them there until the feeling passed. The Slant Six shuddered as its roof scraped the Bentley’s hull; the shrill noise curled her toes. No sooner had they cleared the Bentley than another vessel, with the image of a blazing comet stenciled on its side, cut into their flight path. “Comet!” Loman snapped the stick back and to the right. They shot upward with a starboard roll, just missing the Comet as it barreled past. Loman leveled them out in time to avoid a row of cruising channelships awaiting their turn to launch. The Slant Six weaved in and out of the slow moving ships so quickly that the line appeared to be standing still. Loman continued to navigate the quickly eroding pattern of traffic inside the station. The mouth of the main tunnel came into view, with open space beyond it. Portia gave a weak nod. Whatever flaws the man had as a human being, she was thankful he more than made up for these with his piloting skills. Island Earth Grand Central was utter bedlam as the other pilots reacted to the rogue channelship. Several ships spun in directionless circles while others bumped each other like a flock of feeble-minded geese in flight. Sirens from the station patrol blared, but it was already far too late for anyone to catch the Slant Six sprinting toward the exit. The colossal dexelized head of the Abacus materialized to block their departure from the interchange. You’d think her gently drooping face would look a hundred times sweeter on such a titanic scale, but nothing could be further from the truth. At fifty meters across, those normally soft wrinkles became deep, dark chasms; her rubicund cheeks expanded into twin reproductions of the planet Mars—acrid and inhospitable. Loman rocketed the Slant Six up the left nostril of the monstrous Abacus. He’d gotten them safely into the tunnel, and so all they had to do now was survive these last couple kilometers of intermittent darkness as they blasted down the flashing passageway. Punishing vibrations shook the Slant Six, rattling her from stem to stern. Sitting on her hands, Portia gripped the bench seat even tighter. The shaking grew worse by the millisecond, threatening to tear them apart. A sizeable chunk of outer skin plating tore off the nose of the channelship. The twisted section of hull slammed into the forward transom and proceeded to bounce along the length of the Slant Six, banging and clanging as it went flying off into the blackness. Portia and Loman looked at each other, she with worry and he with what had to be feigned confidence. The Slant Six was still shuddering as she shot out of the open crater beyond the domes of Island Earth. Portia felt the g’s push against her chest as they broke from the weak gravity of the moon. At last, they catapulted into the cosmos, free from the constraints of artificial atmosphere and away from confined spaces. Loman wasn’t smiling as he made a few more corrections on a console glowing cool blue from the hot ice beneath its surface. The vibrations instantly stopped and the roar of the ship’s emergency thrusters was silenced. All went quiet as sanity finally returned to their encapsulated world. The absence of sound was pure manna for Portia’s ears. “We’re using her magneto-static drive now,” said Phin as he let go of the control stick. It retracted back into the floor panel. The Slant Six settled in and drifted silently into the expanse of stars. “Whatever you say… whoever you are,” he muttered. 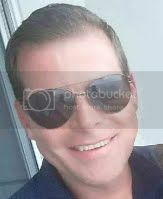 Born and raised in West Palm Beach, Florida, Christopher Cobb ventured off to the wilds of New York City for several years to experience the world of acting. Finding it a cruel and inhospitable world, he hid high in the Appalachian Mountains of North Georgia for a time. Having grown weary of snow and perilous black ice, his life path took him back home to south Florida where he earned college degrees at Florida Atlantic University. He now lives in Jupiter—the city, not the planet—with his true love and talented artist, Alicia, their two weird cats, Simon and Weezy, and his amazingly wonderful daughter, Emma. He is a member of the Bloody Pens Writers Group, as well as the Florida Writer’s Association and intends on writing more exciting books for publication. All this makes Christopher a very happy man indeed. Visit him at www.chrisfcobb.com.